Between 18 November 2017 and 20 January 2018, the Maltese public will have the opportunity to come into close contact with original works on paper and some paintings by international exponents of Modern art. 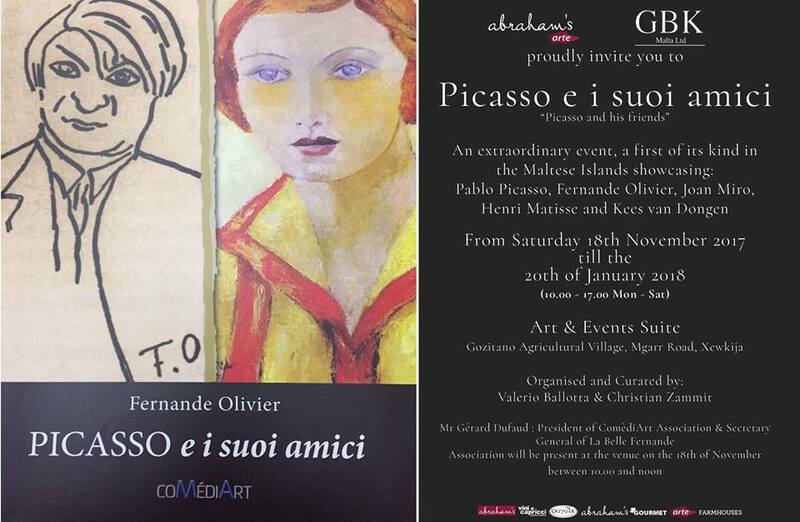 This exhibition is being held alongside the presentation for the first time in Malta of the 2016 CoMediArt edition of Fernande Olivier’s publication ‘Picasso and his friends’. The exhibition will include original etchings, lithographs, aquatints and drawings by Pablo Picasso, as well as other influential 20th-century artists: Joan Miró, Henri Matisse, Kees van Dongen, and Fernande Olivier herself. “La belle Fernande” is best known as Picasso’s model of whom Picasso painted over 60 portraits. She was the first female who played a significant role early on in the artist’s life in Paris, as his lover and muse. But Fernande Olivier was also an artist. Her written accounts on her seven-year relationship with Picasso is exactly what is narrated in this publication: an intimate and unique view of one of the most important époques for art and culture. The book tells a tale of a young and fiery Pablo Picasso and the close friendships that ebbed and flowed: the generosity of Max Jacob, the avarice of Guillaume Apollinaire, the opportunism of the painter Marie Laurencin, the captivating Henri Rousseau, Van Dongen for whom “la belle Fernande” modelled, Georges Braque’s ‘rivalry’, the keen eye of art dealer Ambroise Vollard, the friendly feud that ensued with Henri Matisse, and the shrewd Gertrude Stein whose patronage was key to Picasso’s success. These are Fernande Olivier’s thoughts, penned during the period that gave birth to Cubism as well as other important developments in art, poetry, music and cinematography. The exhibition ‘Picasso and his friends’ will also feature a documentary recorded in 2016 by Anna Marceddu, in which Maya Picasso, Picasso’s daughter, and Gérard Dufaud, Secretary General of the the Association “La Belle Fernande” and President of CoMediArt Association, discuss and recount Picasso’s life during that period where momentous events unfolded in the environs of Montmartre and Montparnasse in Paris. The event is being curated by Valerio Ballotta and assisted by project coordinator Christian Zammit. It is organised by GBK Malta Limited and Abraham’s Arte. It is taking place at Abraham’s Art at Gozitano Complex, Gozo. This is also being made possible thanks to the collaboration of the Modigliani Archives, Paris. Mr Dufaud will be present at the venue between 10.00 am and noon on Saturday 18 November.